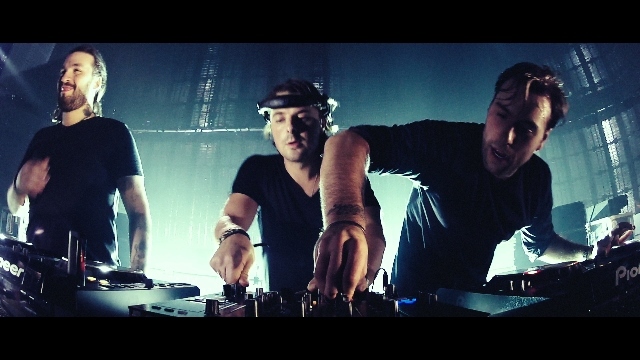 Steve Angello (left), Axwell (center), and Sebastian Ingrosso of Swedish House Mafia. In the history of Billboard's Hot 100 chart, how many bands have decided to break up before releasing their first Top 10 single in the U.S.? There can't be many, but Swedish House Mafia is one such band. In June of 2012, the electronic dance supergroup, composed of DJs/producers Steve Angello, Axwell, and Sebastian Ingrosso, announced that their next tour would be their last. "Don't You Worry Child," the trio's final single before disbanding, had yet to be completed at the time of the announcement, but the song made its live debut in England the following month and was released to radio later that summer. That fall, within a week, the group sold over one million tickets to its final four months of shows. Dubbed One Last Tour, the trek took Swedish House Mafia to packed arenas and stadiums in more than 20 countries. For his feature-length documentary, Leave the World Behind, director Christian Larson covered a far and wide range of geographical territories to capture the frenzied sights and sounds of the farewell shows. Interspersed are individual interviews, footage of behind-the-scenes tensions among the group members and more tranquil moments at home with their respective families. Larson, who also wrote and directed the 2013 Sigor Rós short film, Valtari, spoke with Under the Radar to discuss the process of making Leave the World Behind. Chris Tinkham (Under the Radar): How quickly did this project come together? Had you been shooting anything with the group when they decided to break up? Christian Larson: The story goes back to 2007, when I met them the first time. I shot a short documentary about them that came out in 2010 called Take One. That was basically documenting them leading up to their first single. That played a part in the band growing and building a fan base. People got connected to them via the film in addition to the music. And then I went on to other projects. I do music videos, commercials, and short films. I was working on those for a couple of years, and then they rang me and said, "Christian, we're breaking up the band, and we're going on a last tour. You wanna come and film it?" I said, "Wow, that's crazy, but of course. I filmed the beginning and I should film the end." So it was their idea to document the tour. Yeah. Documentary filming has been a part of the band all the way through, working as sort of a fourth wall to the audience. The camera's been there a lot, and I think that shows in this particular film, that they're quite used to having the camera there. They're comfortable with it. It's been a natural part of their success also. How did you get to know them prior to making the first film? I started listening to house music in 2007. I just loved it, so I went to experience the whole thing in Europe. I thought, "Wow, this is something else," that energy in the clubs and the people praising that DJ up there that controls the audience with his music. I found it fascinating. And down there I saw these names on billboards. I saw their solo names, and I heard they were Swedish. I didn't even know that there were Swedish guys doing this. Sweden's a small country, and it's very likely that a friend of a friend of a friend knows someone. And there I was that summer, and I met them. It just struck me right away that these guys are, first of all, crazy. But second of all, there were three. All the other DJs were solo. These guys were a group of three quite different characters, and there was a relationship between them, and that is something that is great for filming. Also, I really believed then that "these guys are gonna break. These guys are gonna make it big in some way." As a filmmaker, to think something like that, you just want to pick up a camera and start filming it and hope that you capture something that will break out. For this film, when you had the three of them together on camera, was there any temptation to instigate a group talk to hash out their differences? There is that one great shot where the three of them are sitting together looking bored and not speaking to each other. That's what I mean. That kind of says it all. It's being said without words. How does the band operate, creatively? We see that Sebastian is quite discouraged when Steve goes off and gets a tattoo. Do they usually work three in a room? Yeah, they've always done that. I think that dynamic of the three really comes across in the music. All the music numbers are their music, and I think it was important to show music numbers that represented different emotions, different characteristics of the three of them: it has rawness, aspects of love in some moments, and euphoria. That's really the experience when you're there dancing in the club. I wanted to make an honest portrayal of that. It's almost like a musical. [Laughs] Production-wise, I think that's the combination. That frustration, sometimes, and that love that they have among the three of them comes out in the music, because it's always been a collaboration between the three. Going back to Steve getting the tattoo, it appears from that scene that he might be the prima donna of the group, but then we see how he's the most respectful of the three when they arrive in Malaysia. Was it important to have that balance? Yeah, it comes back to the fact that when we set out to make the film, I said to them, "This film needs to be honest, and it needs to feel human." This world of EDM is starting to come off as very polished, where everything is success and everyone is buying private jets and wearing fancy glasses. I never saw that side of it. There's a human story behind it, and it's up and it's down. There's so much more to it, and I wanted to show all of that. The two things you mention, that was a way of showing that nobody is better than the other in this group. They all have their days and their moments, both creative brilliance and also when they fail to meet their fans' expectations. How did the overhead shot that opens the film come about? You mean on the boat? Everything is honestly documented and real all the way through how we shot the film, but in the end, when they're going to the last gig in Miami, I wanted to spice things up a little bit, to add as the opening shot. I came up with this idea that sort of represented these fans and the genre and the phenomenon that it became. It was a metaphor for this whole thing, the rise of this genre. How did you get the shot of the kid on the wheelchair at the show? I shot a whole lot. I was really amazed by the personalities and the people at all these concerts. I had never seen any crowd more intense or energized. These fans are incredible in the way they go bananas and let go and engage in the show, especially the shows they did in India. You see these people in turbans jump and scream like crazy. Yeah, it was just all organic moments. It kinda shows that there's a lot of love in the crowd at these electronic shows, throwing this guy up on a wheelchair. It's a beautiful thing, in this world with all these problems, that crowds come together. I'm working on commercials, and I have this short film that I worked on with a choreographer in modern dance, and then I'm developing a feature film project over the next year. Do you expect there will be a Swedish House Mafia reunion? Leave the World Behind is playing in select theaters for one-night events. Cities and dates are below. The film will be released on iTunes on April 15, as will a two-disc, 28-track live album, One Last Tour: A Live Soundtrack, recorded in Los Angeles.